After all, immortal Mozart singing still does exist! (...) Soile Isokoski's Mozart rendition is a true revelation and can hardly be topped technically nor stilistically. (...) One of the best albums available of Mozart arias. 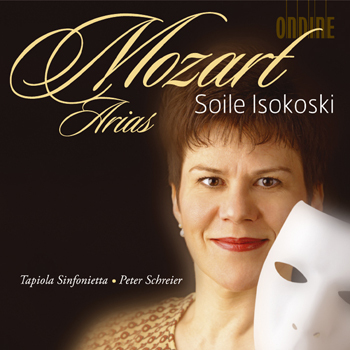 Is there a finer Mozart singer today than Soile Isokoski? Her sumptuous lyric soprano is in its absolute prime. And she deploys it with unfailing beauty and insight into character and situation. The silvery warmth of her timbre, occasionally reminiscent of Schwarzkopf in her earlier recordings, is the near-ideal instrument for Countess Almaviva, Elvira and Fiordiligi. Ruhe sanft is surely a candidate for Mozart's loveliest aria, and I don't think I've ever heard it sung with such caressing tenderness and beauty as here… This is superlative Mozart singing by a soprano in her absolute prime. Here is the perfect singing delivered by the kind of voice whose sheer beauty makes the hairs on the back of your neck prickly. This CD features star soprano Soile Isokoski with famous opera and concert arias by Mozart, including "Dove sono" from Figaro and the minuet-lullaby "Ruhe sanft" from Zaide. Conductor Peter Schreier - who is one of the great tenors of the 20th century - leads the Tapiola Sinfonietta throughout the programme. The concert aria "Ch'io mi scordi di te?" - a hybrid of piano concerto and opera genre - features a piano soloist part, performed by Mrs. Isokoski's longstanding duo partner Marita Viitasalo.